Phew! Took a little while but we have word now that InSight's solar panels are open and collecting sunlight. This solar-powered robot is ready for action. In all, it was a big day for InSight, its team and its fans, both those on Earth and off. Ben Burress, Chabot Staff Astronomer and KQED's space blogger, gives us an overview of the day and a preview of what's ahead for InSight. And, that's it for now folks! Later today we'll update once NASA's Mars Odyssey orbiter confirms that InSight's solar arrays have deployed. This may happen around 5:35 p.m. Pacific, but could be many hours after that. Once the solar panels are out, the two-year surface phase of this mission has officially begun. Lots to celebrate for the Mars InSight team. The lander still has a bit more work to do. Later today, once the dust its kicked up settles, it'll unfurl its twin solar panel arrays and check in again with home. InSight sends its first picture home, relayed by the MarCO satellites. Picture a little obscured by dust, but clearly shows the horizon of the red planet (and it has a lander leg in it). InSight has landed! TOUCHDOWN CONFIRMED. Fans around the world erupt. Lots of fist bumping. InSight now has a new home. Parachute is working! Hoots and claps from mission control and space fans at Chabot. All good news so far. InSight is now experiencing peak heat. Stay cool up there! Next step will be the parachute deployment. Travelling at 1,000 meters per second. Audience at Chabot is holding their breath. ENTRY! The lander has entered the atmosphere. Now it will slow down as it approaches the surface. The lander has separated from the spacecraft that carried it millions of miles away from home. The lander is now steering itself. Star Tracker software turned off and InSight is going in. T-20 till land. Update from Mission Control: Both CubeSats and the Mars Reconnaissance Orbiter have checked in and all seems good. Curious about the instruments aboard InSight? They're the product of teams from the U.S., France and Germany. Learn more. NASA's livestream from mission control at the Jet Propulsion Laboratory has started. Peanuts, a tradition to bring good luck to landings, are being passed out. Chabot's theater is almost full with members of the public, like the Crawford's of Hayward who brought their young daughter. With the minutes ticking down till Mars InSight's anticipated landing at 12:00 p.m. Pacific, KQED Science is ready to bring you up-to-the-minute information on the mission. We'll embed the live feed from mission control at NASA's Jet Propulsion Laboratory in Pasadena. And we'll bring you the scene from the viewing party at the Chabot Observatory in Oakland. Where are you watching the landing? Tweet us @KQEDScience and @DanielleVenton. First, some background on the mission. This is the first mission to land on Mars since 2012, when the Curiosity rover touched down. Unlike that landing, with its novel, high-risk innovations (remember the 'sky crane'? 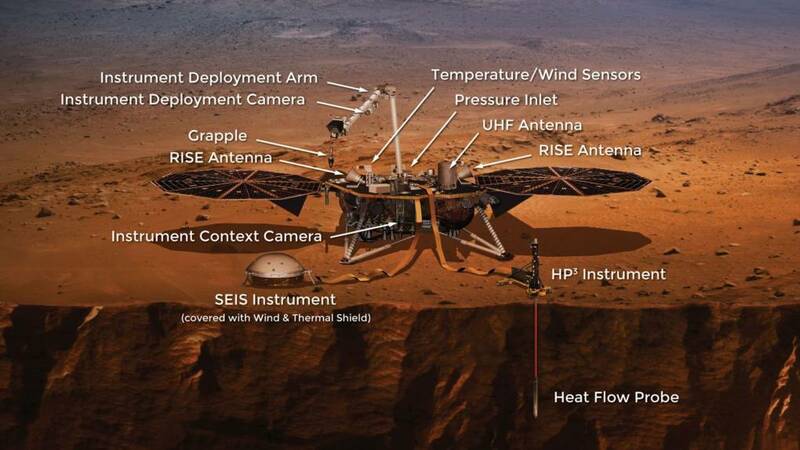 ), InSight is landing using tried-and-true technology. The landing sequence will be similar to past missions, such as NASA’s Phoenix Mars Lander. There are three main stages of landing. Entering the Atmosphere: Small rockets will direct the spacecraft toward the surface. The rockets must maintain a precise 12-degree angle to prevent InSight from either burning up or bouncing off the planet's surface. Parachute Descent: The spacecraft will cast off its heat shield (a protective covering), release a parachute to slow down, and extend its three, shock-absorbing landing legs. Powered Descent: A dozen engines, known as retro rockets, will begin firing to help the lander set down gently on the Martian soil — its new permanent home. Want more info? See the sidebar above. Anything going wrong at any one of these steps could cause this $830-million dollar mission to crash, burn up or bounce off back into space. But at the moment, all seems ready for a smooth landing. Yesterday InSight's engineers made a final flight path tweak to maneuver the spacecraft over its targeted entry point.